Easily connect and disconnect coaxial cables with the patented X-RJAX snap-in connectors. Screw the socket onto a standard F type coax jack and attach the plug to your coax cable... like a telephone cable, the coupler snaps together with a click! If you frequently need to connect or disconnect coax cables, X-RJAX couplers will save a lot of time. 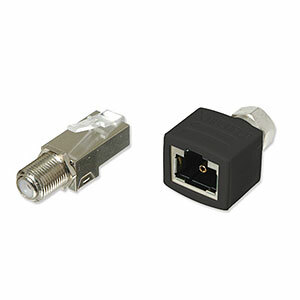 Includes 1 female F type connector to male X-RJAX plug and 1 male F type connector to female X-RJAX jack.